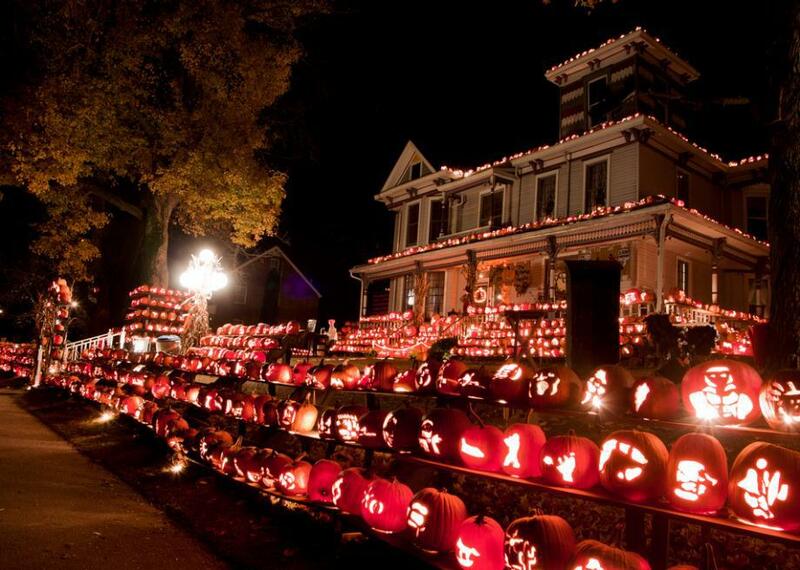 Kenova, West Virginia's Pumpkin House lights up 3,000 jack o' lanterns every Halloween. The Kenova Pumpkin House in all its glory. Every year the former mayor of Kenova, West Virginia, takes his historic home along the Ohio River and turns it into a showplace for Halloween extravagance. All it takes is three weeks, hundreds of volunteers, and 3,000 pumpkins. Kenova is in far west West Virginia, at the split of the Ohio and Big Sandy Rivers. At last count the population was just more than 3,000, so maybe it’s no coincidence that Ric Griffith, owner of the Queen Ann–style house on Beech Street (it’s on the National Register of Historic Places) settled on 3,000 as just the right number of pumpkins; that’s one for each Kenovan. Ric used to be the town’s mayor, and he owns the town’s pharmacy too. That’s where it all started, with just four pumpkins decorating the Griffith & Feil Drug Store. (Ric lived upstairs at the time.) When he and his family moved to the Beech Street house, that number was up to 500. Then 1,000. And by the year 2000, he was overseeing the scooping and carving of 2,000 pumpkins. One year later, despite his volunteers’ cries of “enough!” he settled on 3,000 and has kept it there ever since. Hundreds of volunteers help with the drilling, scooping, rinsing, and carving of each pumpkin, and it takes another legion of carpenters and electricians to build-out and rig-up the displays. During the first week of October a local farm delivers the pumpkins, and from then until the town’s C-K Autumnfest (for 2016 that’s Oct. 28 and 29), it’s a flurry of pumpkin guts, bleach baths, and jigsaws to get ready for the lighting. After all that work, the display comes down after Halloween night. The Pumpkin House has been a Kenova destination for nearly 30 years, with no charge to any visitor and no donations accepted either. But if you insist on spending some money, you can hit up the food trucks out front.